Happy Tuesday. Happy unofficial end of summer. Happy first day of pumpkin recipe sharing season. I was waiting for the unofficial last weekend of summer to pass before I shared a pumpkin recipe. Of course, I have been participating in pumpkin recipe eating and pumpkin beer drinking since the end of July but can we keep that between you and I? In addition to shopping, grilling, cleaning my house and beer consumption, I made two soon-to-be-shared pumpkin recipes over the weekend – vegan pumpkin spice coffee creamer and vegan pumpkin cream sauce. 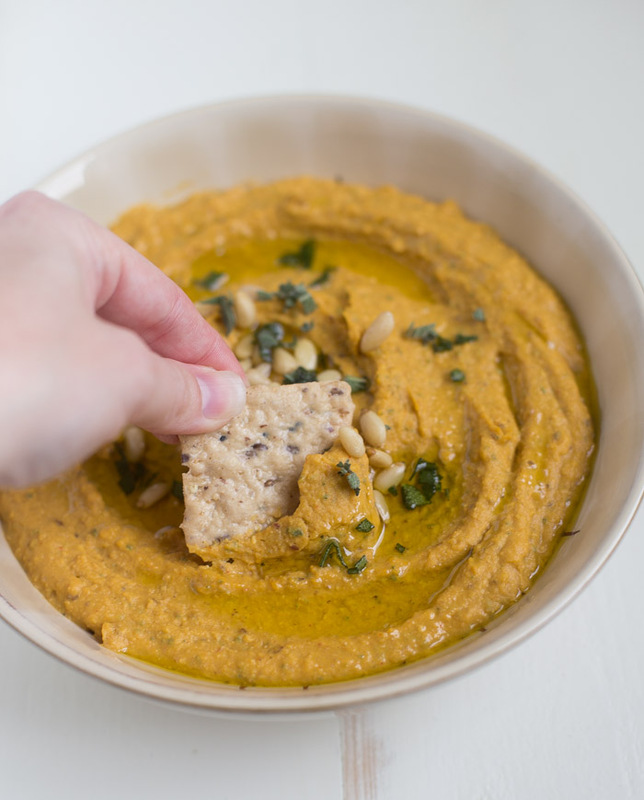 The pumpkin hummus I’m sharing with you today, well I made it 3 weeks ago. Yeah, I made it in August. I was preparing for pumpkin season early because I love fall and because I know people start looking for pumpkin recipes come early September. Hey do you remember what I said on Thursday about reducing waste and using items I have in my pantry instead of buying groceries all the time? My goal is to stop the food waste and save money. I’m happy to report that I’ve only gone to the grocery store once since Thursday! This is a HUGE deal and a great accomplishment because I usually go to the grocery store at least twice during the weekend. I’m going to try to avoid the grocery store this week and only go once this weekend. I hope I can do it. I know I can do it. it has dried cranberries and sage in it. it’s topped with more sage and some pine nuts, too. it can be made in a blender or food processor. use it on sandwiches, as a dip, on a fall themed hummus toast. Soak the cranberries in the water to soften. Drain and place in a food processor. Place sage, chickpeas, garlic, pumpkin, tahini, ground chipotle powder, pine nuts, evoo and maple syrup in a food processor or blender. Pulsate until smooth. Mix in salt to taste, if desired. Place in a serving bowl and garnish with pine nuts and chopped sage and drizzle with a little olive oil. nutrition information is approximate. Use of garnishments will alter nutrition information. I”m with you on the first day of pumpkin season! 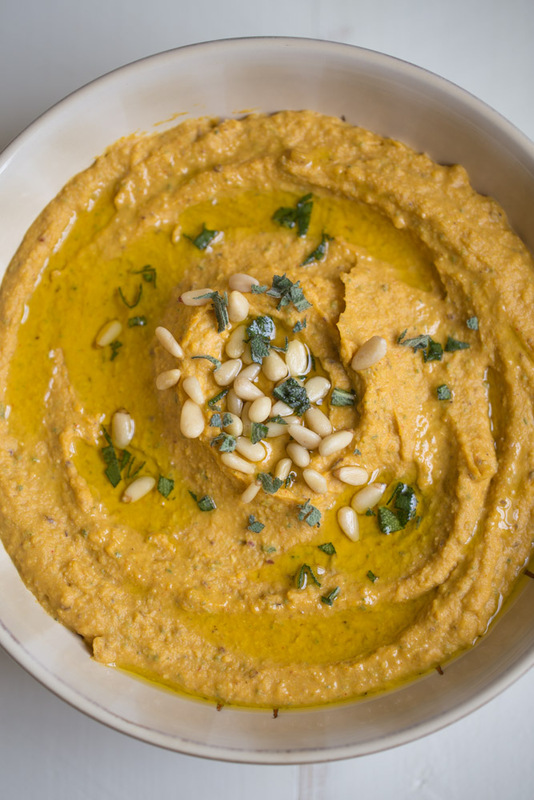 I love this hummus – it’s so unique and perfect for fall. Pinned! Woohoo! Hooray for first day of pumpkin sharing season. <3 Thank you for the compliment and the pin, too. What a great fall twist on a classic dip! 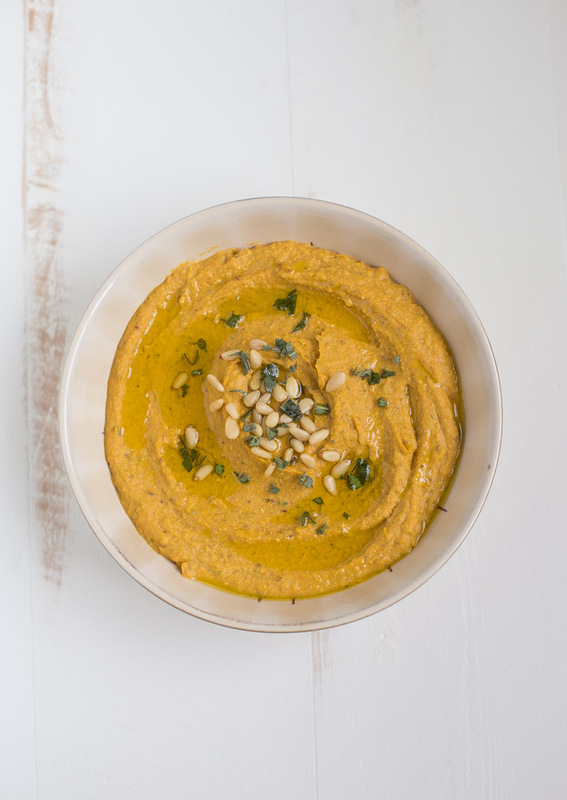 Wow – LOVE LOVE LOVE the combo of pumpkin and chipotle powder in this hummus! What a wonderful flavor combo! Thank you, Shashi! I love adding a little heat to my recipes. Summer is over and we are bringing on the pumpkin! Love this hummus! I love love this idea!! It’s spiced up perfectly!! I’m so glad it’s finally a good time to start pumpkin sharing. I make my pumpkin hummus very similar, but I’ve never ever thought of adding cranberries to it. Just by reading the title I started to picture how great they would be in a pumpkin hummus and now I can’t stop thinking of them. I have to try this, so creative! Beautiful hummus! Love the use of pumpkin! Pumpkin should be year round! There is actually a coffee place in my town that has the pumpkin spice flavor year round. WIN. Thank you for the pin and for visiting, Lindsay. Pingback: Great Ideas -- 18 Game Day Recipes! This dip looks delicious! Thanks for linking up with What’s Cookin’ Wednesday! Congratulations! You were featured this week at Awesome Things Tuesday – 92! Thank you for sharing with us, and we hope to see you again this week. We LOVE your blog! Oh my this looks & sounds so delicious. Thanks for sharing at the party! Hope to see you again this week. Pinned & shared. We don’t have tahini paste where I live. Very limited ingredients to what they can barge into our tiny little island. What is a good substitution? Hello! If you can find sesame seeds, you can make your own by grinding the seeds with a mild tasting oil. Below is a link. You could also use sunflower seed butter (make your own by grinding sunflower seeds and mild tasting oil. I’ve even seen people use peanut butter but I think peanut butter flavor would be too strong. Oh thank you! I should be able to find one of those or maybe pine nuts? I will have fun trying what I can find and let you know what is really good! Can’t wait to try this recipe! Yay! Thank you, that will help tremendously <3 Gonna make this week! I made this today for the party and doubled the recipe so my son could take some home. This hummus is outstanding!!! Thought I would take advantage of fresh pumpkins while they are here so roasted a sugar pie pumpkin and scooped out the flesh instead of using canned. I always substitute raw sunflower seeds for pine nuts because they are so much cheaper and the taste doesn’t suffer. I also reached for the chipotle powder that I thought was in the spice bin and it had poofed so I used smoked paprika instead. So, now that I don’t have any for myself, am headed back to the store tomorrow to get another sugar pie pumpkin because this stuff is incredible! And I won’t have to share my batch with anyone : ) Thank you – this is a keeper! I’m going to try it this weekend. Great recipe! Love it! I really love the color! I’ve been looking for random pumpkin recipes today because I’ve been craving for anything pumpkin a lot lately. This looks so good! I might just make it today! Thank you for sharing the recipe! Ill definitely try this at home, something I can snack on with my favorite crackers. Can I also use raspberry or will it taste totally different? Ive been using it a lot lately to helo me with my digestion.